It’s not often you walk into a restaurant in Vientiane and feel like you’ve just stepped into a sophisticated outdoor dining oasis. A visually and gastronomically impressive venue, InTown is a new-found heaven for socialites and foodies alike. 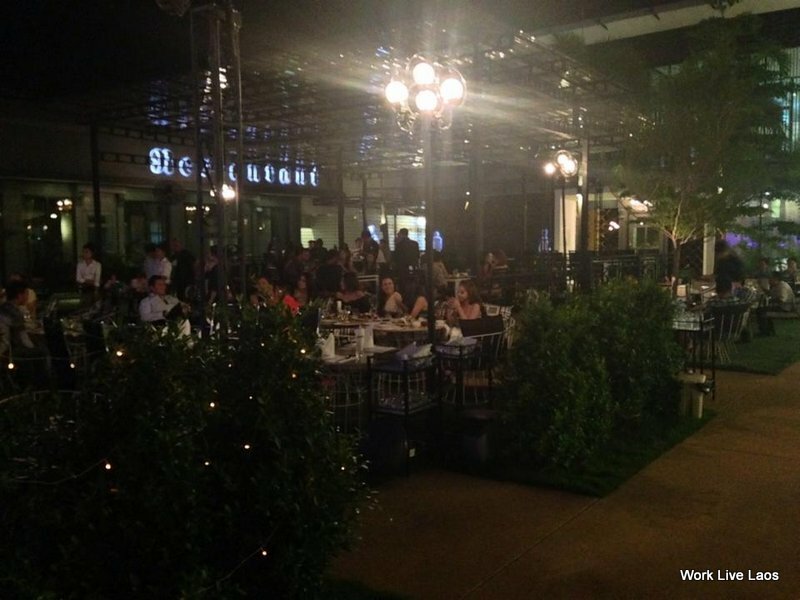 The restaurant’s three expansive two storey buildings form a U-shape that surrounds a large, open outdoor dining area, with attractive garden areas, floating stage, water feature, and live music setting it apart from other restaurants. Adorned simply but with a touch of luxury, the décor is impeccably modern and fresh. Low set wire garden furniture with large, soft cushions are located on the ground floor while modern dining settings occupy the indoor and upper dining areas. The entire restaurant is illuminated by fantastic mood lighting which creates a tranquil ambiance. The staff are well-trained, plentiful and attentive. With a mix of Western and Asian meals for lunch and dinner and with a wide price range, everyone is catered for. You’ll find appetizers from 35,000 kip, Asian mains from 40-140,000 kip, Western mains from 40-100,000 kip and meats from 120-190,000 kip. The discerning foodie will appreciate that each meal served appears exactly as it does on the menu, and this is because InTown hires multiple chefs, each dedicated to a particular cuisine. The wine was a little pricey and only red was available by the glass. Meanwhile, the cocktail list is outstanding, as is the taste, although they do make them small but strong (recommendation: we hear there is a happy hour on Wednesdays). One other point was that table water was not complimentary. Making up for this, however, was the quality and size of fare enjoyed. – Mushroom laab (30,000) – a unique and fantastic version of laab with a fresh mint, coriander and lime zest. Possibly a heavy on the onion but perfectly cooked. – Crispy skin potatoes (35,000) – a moorish dish that anyone would struggle to say no to. The potato was indeed crispy on the outside and soft in the centre, covered with sour cream, mozzarella, bacon bits and green onion. – Duck in orange sauce (80,000) – a beautifully presented dish with an intense but enjoyable tangy orange sauce. The duck was tender, moist and ultimately satisfying. – Beef steak with mixed vegetable (120,000) – served on a sizzling plate this dish had a strong, sharp peppery flavour without being too fiery. A large and varied serve of vegetables complimented the steak. – Shepherd’s Pie (50,000) – perfectly seasoned, homemade and comforting were the words used to describe this dish. The tomato essence of the sauce left an aftertaste to savor and was a perfect wholesome size for a hungry diner. To see the style and culinary proficiency Vientiane has to offer, visit InTown … because when you’re in town, you’ll feel like you’re somewhere else. 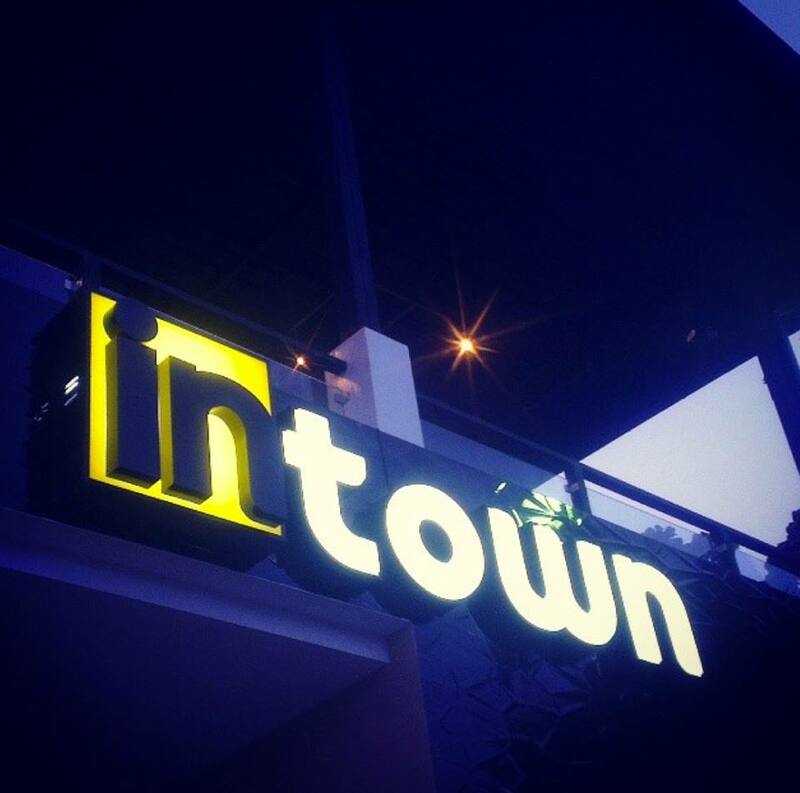 You’ll find ‘In Town’ Restaurant off Asean Road (Hom 1) in Ban Nongduang Tai. ??????????????????????????????????????????????????? ????????????????????????????????????????????????????????????? ???? ???????????????????????????????? ; ??????????????????? ?, ?????????????????????????????????????????????????????. ?????? ?, ?????????????????????????????????????????????????? ?????????? “InTown” ?????????????????. ?????????????????????? ???? ???????????????????????????????????? InTown, ??????????????????????????????????????????????????????????????????????????????????????????????????????????????????????????????? ???? ???????????????????????????????????????????????????????. ??????????????????????????????? 3 ??????? ?, ?????????????? 2 ????? ??????????????? “U” ?????????????????????????????????????????????????????? ?, ????????????????????????????????? ???? ????????????????? ?, ??????????????????????????????????????????????. ??????????????????????????? ?, ?????????????????????????????????????????????????????????????????????????????. ??????????????????????? ?, ?????????????????????????????????????? ?????????????????????????????????????????? ??????????????????????????????????????. ??????? ?, ????????????????????????????????????????????????????????????????????????????????? ???????????????????????????????????????????????. ??????????????????????????????????????????????????????????????? ???? ????????????????. ????????????????????????????????????????????????????????????????????????????????? ?????? ????????????????????????. ?????????????????????????? ?, ????????????????????????????????????????????????????? ???? ??????????????????????????????????????????????.? ??????????????????????????????????????????????????? ?, ??????????????????????????????? ??????????????????????? ?, ??????????????????????????????????????????. ??????????????????????????????????????????????????????????????????? 35.000????????????? ?, ??????????????? 40.000 – 140.000?? ?, ??????????????? 40.000 – 100.000??? ???? ?????????????????????????? 120.000 – 190.000???. ???????????????????????????????????????????????????????? ????????????????????????????????????????????????????????????????????????????????????????????????????????????????????. ?????????????? ?, ?????????????????????????????????????????? ?, ????????????????????????????????????????????????????????? : ???????? “?????????? ?”, ?????????????????????????????????????????????????????. ???????? ?, ??????? ??????????????????????????????????? ??? ??????????????????????????????????????. (??????? : ????????????????????????? Happy Hour ?????????????). – ??????? (30.000???) – ????????????????????????????? ???????????????????????? ??????????????????? ?, ?????? ?, ?????????? ??? ?????????? ?????????????????????????????????? ??? ????????????. – ?????????????? : ????????????????????????????????????????????????????????? ??????????????????????????? ?, ??????????????????????????????????????? ??????????????????????????? ?, ??????????? ?, ????? ??? ?????????. – ?????????????????? (80.000???) – ??????????????????????????? ??? ??????????????????? ?, ????????????????????????????????????????????????????. ???????????????????? ?, ??????????????????????? ??? ???????????? ????????????????????????????????????????????????????. – ????????? ??? ????????? (120.000???) – ????????????? ?, ????????????????????????? ??????????????? ?, ?????????????????????????? ??????????????????? ????????????????. – Shepherd’s pie “?????? ?” (50.000???) – ????????????????? ?, ???????????????????? ??? ????????? ??????????????????????????????????????????. ????????? ?, ????????????????????????????????????????????????????????????. ????????????????????????????????????????????????????????? ?, ????????????????????????????????? “In Town”. ????????????????????????????? ?, ???????????????????????????????????????. ?????????????????????? ???????????????????????? ?, ???? 1, ?????????????? ????? ?.